As industrialization developed and required very many workers in cities, there was an influx of population from rural areas in the same country or from abroad into the booming urban centers. Many of the newcomers had never lived in a city and needed much help in adjusting to their new place of residence. Their children, in particular, were at risk since their parents spent many hours working. Public schools, in many places did not go out of their way to welcome these children who came from backgrounds where education was not esteemed. Indeed, no laws prohibited child labor so many parents were happy to see their children employed at young ages. A settlement house movement developed in London and then spread to the United States. The idea was that charitably-inclined prosperous people would establish an outpost in the dangerous and impoverished neighborhoods where new migrants to the city clustered. People would be recruited to educate and train the newcomers, but the emphasis was upon training the newcomers themselves to become the key trainers. For the most part, the settlement house movement was secular, although some settlement houses were sponsored by churches and attracted people who wished to preach a Social Gospel to the poor by living in their neighborhoods believing that this fulfilled the Christian mission. The first settlement house was one established in London’s East End in 1884 by Samuel Barnett who was a minister. The idea quickly spread to the United States and, in 1886, a Neighborhood Guild was established in New York City by Stanton Coit and Charles Stover. Jane Addams became the leading spokespersons for the settlement house movement in the United States. She founded the famous Hull House in Chicago in 1889. She not only emphasized programs that would, as we might say today, empower the poor, she also advocated research about the causes of poverty. Detroit, so far as I know, never developed a reputation as a central point for the settlement house movement. Most settlement houses provided some type of educational training and assistance for people seeking jobs or better housing. In many cities, the professional staff of the settlement houses became active in the social reform movement of the early industrial era. This involved great efforts to improve the quality of housing for the poor, safer working conditions in factories and limits on the hours of employment of women and children. In the early 1880s, a group of women in Detroit recognized that the children of poor immigrants needed much assistance. They were members of an organization called the Western Association. I presume that these were the wives of the growing white-collar middle class. It was not thought proper for prosperous married women to work outside of their homes but many of them recognized a need for improving the social welfare of the very different populations then arriving in Detroit and living in a city for the first time. Perhaps, the idea of helping children was particularly appealing. 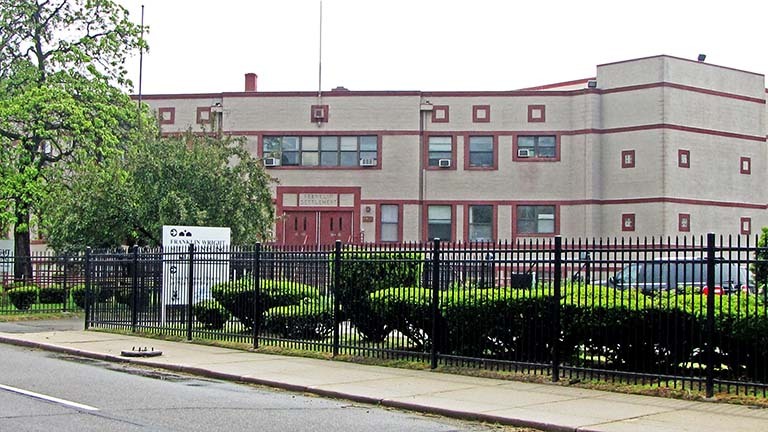 In 1881, they founded the Detroit Day Nursery to provide what we would call kindergarten for the children of the poor on the east side of Detroit. They did not believe in providing services without cost so they charged mothers as very small amount to enroll their offspring in the program. Their efforts were successful, and in 1882, they were able to erect a brick building on Church Street to house their program. Their programs on Detroit’s East Side continued to grow, and in 1889, they established a second school at 400 Franklin. The next year they purchased a building at 443 Franklin, again serving the needs of the poor in that area where immigrants clustered. 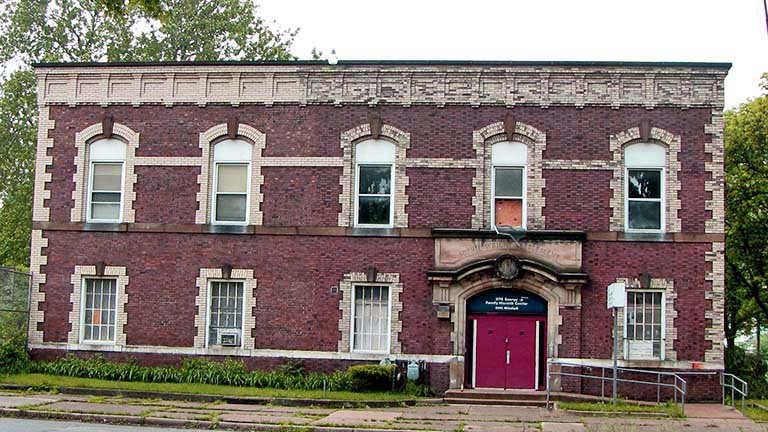 However, the economic crisis of 1892-93 forced the Detroit Day Nursery to shut down. Attempts were made to preserve and restart the laudable efforts of these women. In 1896, Margaret Stansbury was selected to head the organization. I infer that she was a dynamic woman who was able to raise substantial funds and the organization resumed its work. She intended to pursue a career in music but decided to devote herself to ameliorating the condition of the poor, so she went to Chicago where she studied and worked with Jane Addams, the founder of American settlement house movement. Thriving with the leadership of Ms. Stansbury, the Detroit Day Nursery incorporated as the Franklin Settlement in 1901. Thus it became the first organization in Michigan to represent the Settlement House movement. This was a loose collection of organizations and people providing services in impoverished neighborhoods. There was no overarching national organization certifying some programs as official Settlement Houses and turning down others. In 1903, the Franklin Settlement built a gymnasium and a bath house. It will be difficult for some to believe that in low-income areas of large cities such as Detroit, many living quarters lacked indoor plumbing and water systems. In many such areas, charitable organizations or cities erected large public bath houses where people could go to bathe. In the 1920s a donor, Charles Dean, gave a cottage and 200 acres near Lake Orion to the Franklin Settlement. It was put to use as a summer camp for children from their catchment area. In 1930, Edsel Ford, and his wife Eleanor Clay Ford purchased land for the Franklin Settlement, land where the building shown above is located. This was to serve as a new home for the organization. The Rackham Fund—supported by the estate of Horace Rackham who had served as Henry Ford’s lawyer—donated $100,000 for the building. Additional funds were needed, but in 1937, ground was broken for the substantial building that you see on this page. One hundred and thirty-two years after its founding, Franklin Settlement continues to operate from this location. It is a neighborhood human services program currently offering program for youth, for families and for senior citizens. Sophia Wright was born in New Orleans to parents who were planters but lost their wealth in the War Between the States. At age 8, she fell and became crippled. However, she excelled at school. By age 14, she had opened a school for young girls using a room in her home. She was a successful educational entrepreneur and opened a night school for men and boys, a night school since they had to work during the day. Eventually her schools in New Orleans enrolled 1500. She became active in a national movement to improve educational opportunities. She became a friend of Mrs. B. C. Whitney who served as president of the National Society of the United States Daughters of 1812. This was one of many women’s organizations of that era. Mrs. Whitney’s husband was a Detroit businessman who also managed the Detroit Opera House in the late Nineteenth Century. The organization provided lunches for students who lived too far from their homes to return at noon, after school classes for children and educational programs for neighborhood adults. A music school was established in this building and named in honor of Franz Schubert. A distant relative of his taught at this outpost. The activities of this organization increased in the Depression decade since some federal support became available to support such organizations. By the 1950s, the United Fund of Detroit was a substantial supporter of both the Franklin Settlement House and the Sophia Wright Settlement. The population of this area was beginning to decline. After a decade-long study, the United Fund successful convinced the two organizations to merge. In 2013, it appears that the home of the Sophia Wright Settlement is an abandoned building. In the fairly recent past, it had been used by Detroit Edison as a warming center for those who were unable to heat their homes in winter.